Your hard drive is a mechanical device. It contains several moving and non-moving parts that work together to make it operate. 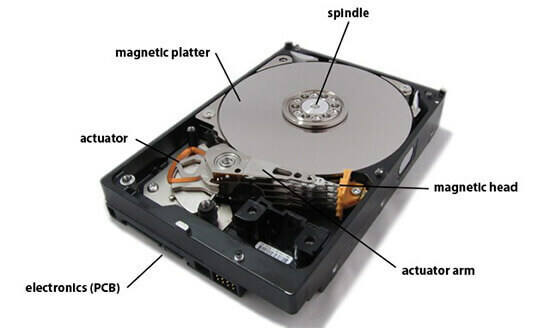 The main parts include; magnetic disks called platters, a high speed motor that spins the platters on a spindle, an electronics circuit board called a PCB, an actuator, actuator arm and magnetic heads that read and write the data to the platters. Finally, firmware is the software that makes your drive operate. Part of the firmware is stored on the PCB board and part is stored on the platters. These two parts work together to make your hard drive operate. The typical desktop hard drive spins at 7200 RPM's. Once the platters reach the correct speed, the actuator arm moves the heads onto the platter where it attempts to read the firmware (software) that boots the drive. The heads actually float on a tiny cushion of air and are not designed to ever make physical contact with the platters. 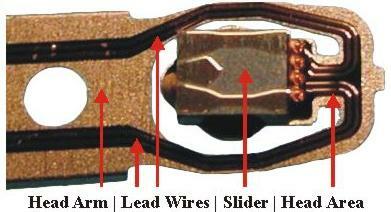 The slider is the key part of the head and the part that is most often damaged. The slider is made of porcelain and it works like the wings of an airplane. As the platters spin, they create air movement which creates lift. This makes the heads glide on a cushion of air across the platters at about 60 mph. The heads fly perfectly level unless the slider becomes damaged. Micro scratches on the heads will make them fly uneven across the platter so the heads will no longer be able to read the information on the platters. This is the number one cause of the head failure and the well known term "The Click of Death". Head failure will always spread quickly and greatly reduce the chance of recovery of your data. This is why we ask you to power off your drive. Hard drives usually fail when they are under extreme stress but hard drives can fail all by themselves too. They don't have to be dropped, flooded or in a fire to fail. Hard drives often start to develop bad sectors which are caused by minor head crashes. This is when the heads of a hard drive make contact with the platter surface that holds your data. Bad sectors can affect your laptop by making it operate extremely slow, crashing or corrupting files, blue screen, boot in a loop, etc... Bad sectors are like cancer, once a hard drive starts to develop bad sectors, it will often degrade very quickly until it is no longer recognized by your computer or you can no longer access the data on the drive. Warning: Do not open your hard drive. Do not push down on it. Do not tap on it, drop it, hit it or put it in the freezer. Do not switch PCB boards. Do not continue to power it on. These things can make your data completely unrecoverable.